After his daughter’s dog was struck down by heart valve disease, UCHealth interventional cardiologist Dr. John Carroll teamed up with CSU veterinary professor to advance cardiology across species. Mango sleeping on his owner’s bed. Photo courtesy of Grace Carroll. 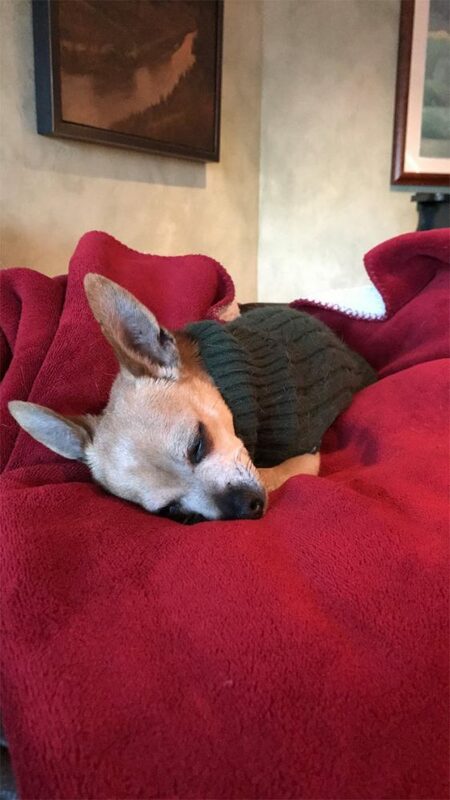 Four years ago, Dr. John Carroll was helping his daughter, Grace, get ready to go back to college when the two noticed that Mango, her 5-pound Chihuahua, wasn’t his feisty self. Usually, 9-year-old Mango would be sunbathing or running around the yard. And as Grace packed her bags, she couldn’t help but wonder if something was wrong with her childhood pet. On this day — and for the past few days — Mango had been coughing and making a “honking” noise, Grace explained. Mango also seemed breathless and exhausted. They decided to visit their vet, who heard a heart murmur. An X-ray also showed Mango had an enlarged heart. The veterinarian referred them to a canine cardiologist. Heart murmur? Breathlessness? Fatigue? Coughing? 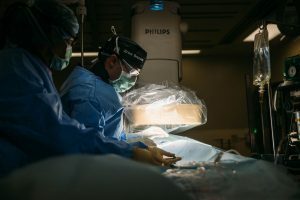 Carroll, an interventional cardiologist with UCHealth University of Colorado Hospital on the Anschutz Medical Campus, couldn’t believe what he was hearing. 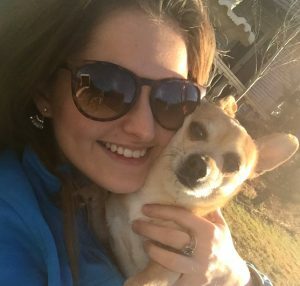 Was it possible that little Mango had some form of heart valve disease? 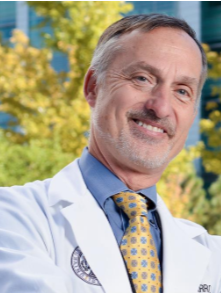 Carroll, who also is an interventionalist and professor for CU School of Medicine, specializes in cardiac catheterization and catheter-based therapies for diseased heart valves, holes in the heart, coronary artery disease and a variety of other novel therapies. Mango was diagnosed with mitral valve regurgitation. Each chamber of the heart has a one-way valve to keep blood from flowing backward. The mitral valve is between the left atrium and left ventricle. This valve can wear out over time and leak — called mitral regurgitation. About one in 10 dogs develops some form of heart disease during their lifetime. Approximately 80 percent of these dogs end up with mitral valve insufficiency or regurgitation, according to vcahospital.com. The disease is more common in small dogs than large breeds. In humans, mitral regurgitation is the most common type of moderate to severe heart valve disease among adults older than 55 in the United States, Carroll said. The disease’s occurrence increases with age, the same as with dogs, he added. Mitral valve disease doesn’t always present with symptoms but, when it does, patients often have a noticeable heart murmur and breathlessness and fatigue with normal activity. 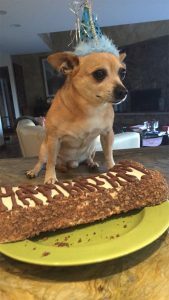 Mango celebrates his 10th birthday a few weeks after discovering he has valvular heart disease. Photo courtesy of Grace Carroll. When a human has a leaky valve it can often be fixed by repair or replacement of the mitral valve with open heart surgery or emerging transcatheter treatments. At UCHealth, a variety of transcatheter treatments for various forms of mitral valve disease are performed. UCHealth hospitals are also investigative sites for several up-and-coming transcatheter therapies, Carroll said. “Unfortunately, they have not been re-engineered for use in small animals like Mango,” he said. When Grace heard that Mango had heart valve disease, she was devastated. Mango lived a year longer but his lively personality and energy never returned. Just before his 11th birthday, he died. “It raised thoughts in my mind, not only of what could be done for dogs, but on a broader scale, there are strong synergies between cardiology care in animals and humans, and let’s start looking into this seriously,” Carroll said. Carroll then learned of a collaborative resource request from Dr. Brian Scansen, a veterinarian and associate professor of cardiology at Colorado State University’s College of Veterinary Medicine and Biomedical Sciences, in Fort Collins. Scansen was in the process of establishing interventional cardiology as a unique and advanced discipline within the school’s veterinary medicine program. Cardiology has expanded over the decades in the human realm and many doctors focus on subspecialties within cardiology, such as heart failure or transplants. Interventional cardiology focuses on procedures that improve how the heart may be performing, such as placing a stent to open a clogged artery or a device to repair a leaky valve. Traditional cardiac surgical operations involve opening up the chest while more recently, in the past several decades, interventional cardiologists perform catheter-based therapies. These less-invasive treatments use a catheter to thread a device through a vein to and inside the heart, where it is placed to correct the problem. As part of advancing the CSU program, Scansen wanted to create a fellowship and open a new hybrid cardiac catheterization lab that would match up to any human lab doing these same interventional procedures. “To develop this new and unique training program, it was key to be able to bounce ideas off someone with that level of experience and expertise,” Scansen said. Dr. John Carroll, an interventional cardiologist with UCHealth University of Colorado Hospital on the Anschutz Medical Campus. Photo: UCHealth. 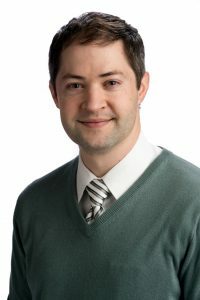 Brian Scansen, a veterinarian and associate professor of cardiology at James L. Voss Veterinary Teaching Hospital at Colorado State University. Photo courtesy of CSU. And that’s when Carroll and Scansen got connected, more than three years ago. CSU’s interventional cardiology fellowship started in 2016 and is the first in the world, Scansen explained. Scansen and his fellows attended some of Carroll’s procedures at UCH. Much of what they needed to learn in animal health care is similar to human health care when it comes to procedures and safety, Carroll explained. Scansen had a patient, a dog named Ricky, who had an atrial septal defect — a hole in the heart. Carroll’s experience was instrumental. Carroll knew the tricks, as Scansen put it, in using the image-guiding technologies to correctly position the device that would plug the hole in Ricky’s heart. Brian Scansen, a veterinarian and associate professor of cardiology at L. Voss Veterinary Teaching Hospital at Colorado State University, and his colleagues perform a catheter-based heart procedure on an animal in their state-of-art cardiac catheterization lab. Photo by Kellen Bakovich, Colorado State University. To do these interventional procedures in animals — as well as to advance the practice as a whole in his industry — Scansen needed the very best and latest equipment. UCHealth has the longest standing structural heart program in Colorado, performing minimally-invasive procedures like MitraClip, Watchman and TAVR in its cardiac cath labs. “We visited UCH to see what they had, what we might need and what we wouldn’t need, as well as how some equipment may be adapted for animals,” Scansen said. Some of the more routine interventional heart procedures were already being done in animals before the creation of the new program, but Scansen wanted to move his subspecialty within veterinarian medicine to the next level. With the lab and training in place, it is time to move to the next step, he explained. Grace Carroll with her childhood pet, Mango. Photo courtesy of Grace Carroll. Carroll said he believes such collaborative partnerships, which aren’t standard, bring a broader “lessons learned” understanding into medicine that can sometimes move the field forward. With some animals having the same valve diseases found in humans, these collaborative relationships can spark new research into the genetic paths of those diseases, as well as technology and devices that could reach across species. “We are hoping that we can develop and interface with the medical-device industry, where there is an unmet clinical need in these dogs,” Carroll said. Currently, Scansen does about 120 catheter-based procedures per year in animals, mostly dogs. But these are the cases where interventions are available, he said, such as with Ricky, who got a device to close the hole in his heart and is doing well. With nearly 10 percent of all dogs developing valve disease, many more — like Mango — would benefit from new interventions not currently available to animals. Carroll said he sees these advancements also benefiting interventional cardiology for humans.